Vanessa is passionate about shaping the future of cities to improve everyone’s work and life experience. Working at the intersection of cities and technology, she founded District Technologies, a community and smart building platform for large commercial or residential portfolios that helps owners save time and money. 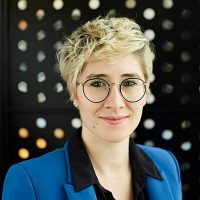 Prior to District, having written her masters thesis at Oxford University on “Understanding the DNA of Strong Entrepreneurial Hubs”, she took her theory into practice by building large coworking campuses (Factory Berlin and Interchange London for Market-Tech).